Here's an interesting post from the Lutheran Theology Study Group: Luther and the Johannine Comma. The manuscript produced for Erasmus was a forgery. Interestingly, Luther followed the first edition of Erasmus, and kept 1 John 5:7 out of the Luther Bible. Bainton says, “But Luther had not sworn, and at this point he adhered to the first edition of Erasmus, though otherwise he was following the second.” [Studies on the Reformation, 8]. "Another interesting note in the history of this edition of the Vulgate is the insertion of the Comma Johanneum (1 John 5:7-8, KJV) by Erasmus. In response to his newly constructed Greek text in 1516, New Testament Greek scholar Metzger points out that, 'One of the editors of Ximenes' Complutensian Polyglot, criticized that his text lacked part of the final chapter of 1 John, namely the Trinitarian statement concerning "the Father, the Word, and the Holy Ghost: and these three are one. And there are three that bear witness in earth."' Metzger goes on to say that Erasmus gave his word that he would be willing, in future editions, to insert the Comma Johanneum if a single Greek manuscript could be produced that included the passage in question. At length one was found and Erasmus inserted the spurious passage. Regarding the sudden appearance of this particular Greek manuscript, Metzger writes: ‘At length such a copy was found—or was made to order! As it now appears, the Greek manuscript had probably been written in Oxford about 1520 by a Franciscan friar named Froy (or Roy), who took the disputed words from the Latin Vulgate. 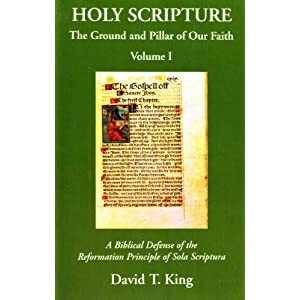 Erasmus stood by his promise and inserted the passage in his third edition (1522), but he indicates in a lengthy footnote his suspicions that the manuscript had been prepared expressly in order to confute him’” [David T. King, Holy Scripture: The Ground and Pillar of Our Faith Vol.1 (WA: Christian Resources, 2001), 166].